Well, as you can see from the photo which was taken at about the 23 mile mark, We are still running and still smiling. The womans courage and determination never ceases to amaze me. The other runner with us is John Strader. John is also a cancer survivor and is a P.A. at the UNC Cancer Center. We caught up to John coming off the bridge around the 22.5 mile mark and he ran in to the finish with us. 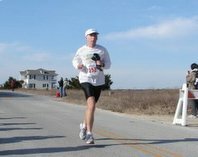 OBX Marathon. Karla was very excited by this news and stated she would be running it. She and her husband Frank own a waterfront lot on Roanoke Island and plan to move there when they retire. 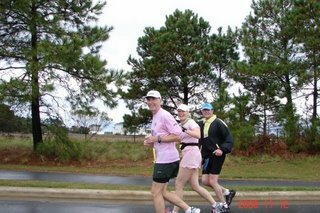 On visits to the Outer Banks they always stay at the Tranquil House Inn on the waterfront in downtown Manteo and the course goes right in front of the Inn just past the 25 mile mark. Although I also wanted to run, it created a scheduling problem for me with Mountain Masochist moving to the first week of November. I knew I would not be able to race it but I still wanted to make the trip and spend the weekend with the Werner's and our friend Jerry. Karla went ahead and entered last November but I waited. Of course as most of you know by this past February Karla was diagnosed with cancer. Knowing that her treatments would continue into this December I had assumed that OBX was now out of the picture so I never entered. I should never have doubted Karla's determination, especially after her brave run at Boston so when it became obvious that she intended to run anyway I sent in my entry. Since Boston, the treatments had been very time consuming and draining for Karla and so she had very little time and energy for any training. We had run three 5k's over the summer and she ran a 10k with Frank last month. Other than that she had only done infrequent 2 and 3 mile runs so we were concerned how she would handle the stress of running a marathon. Once again I would run by her side to keep her company and help to monitor her condition as I had at Boston. It is such a pleasure to run with her at any pace so I was eager to go although I did have concern that maybe she was asking too much of herself at this point. We met at the starting area and passed the time socializing with friends from the NCRC and MTC. Frank was running the half so we wouldn't see him until the finish. Jerry had his own thing to do in the race but his friend Janice that we just met at the start was planning to run with us. We planned to try and conserve as much energy as possible in the early miles so we would use a run/walk strategy from the first mile. We started off easily near the back of the pack and soon settled into an easy pace enjoying the atmosphere and scenery. Reaching the 1 mile mark we started the plan; run to the mile marker and then walk two minutes. We would repeat this pattern as long as she could keep it up. As is usual when we run together, there was great conversation with plenty of smiles along the way. The miles seemed to pass quickly and I was happy to see that she was able to run a relatively good pace and seemed to be feeling good. There was a light rain early in the run but it felt good since it was a bit warmer and more humid than expected . The course was varied and interesting as we ran through the residential area on the sound side of the island with nice views along the way. Somewhere around 8 or 9 miles we entered the Nags Head Wood Preserve. This was one of the most enjoyable sections of the run for us. Besides being a beautiful area, it reminded us of the many miles spent training in Umstead Park. At mile 10, Janice decided to drop back and walk for a while. There were several rolling hills on this dirt road section so we abandoned the timed run/walks temporarily and just walked the hills and ran the downs ultra style. We hit a section of single-track trail about half a mile long and found it most enjoyable. I was amused that they had painted some of the roots along the trail orange to help runners from tripping. I told Karla if they painted all the rocks on Massanutten's trails orange, they would need to use crop-duster planes to spray the whole Mountain. Just as we left the woods and moved out to the highway it began to rain hard and the wind began to blow in our face. Fortunately it was still warm enough that we felt fine. I have run in many rain and thunderstorms and other adverse conditons but this was Karla's first rainy race. She didn't let it dampen her spirits and we cruised along still maintaining a good pace and sticking with the plan. We passed the half in great shape and judging from her conditon I was confident that she would make it to the end now. As the course moved off the highway and back into the neighborhoods, the wind and rain soon passed. The next few miles were most pleasant and we continued to enjoy the scenery and the conversation. Just as we returned once again to the highway it rained again even harder than before and the wind was blowing it right into our faces. We were looking forward to turning away from the wind and hoped that the lighter skies were heading our way before the finish. Finally we made the turn toward the bridge, the last obstacle before the very flat finish. We power-walked the bridge at a good pace and then began to run down the other side. It was about halfway down we picked up John. Then we saw Frank drive by looking for us on the course. He was surprised to find us so far along so he turned around to go wait at the finish. The photo was taken by Frank as he drove by us. During the last few miles we extended the walk break each mile to three minutes but otherwise we were sticking to the plan. It was such a joy to enter the waterfront area of Manteo and run by the Tranquil House. We began seeing friends along the course cheering us on. I was wearing my Pink shirt with the "For Karla" message written on it and we had received great support from the crowds all day. And then it was there, the finish line. I was so proud of her effort as well as amazed at how well she had performed. We finished in 5:25:01, which was 22 minutes faster than at Boston. Our pacing plan worked wonderfully and we only slowed 9 minutes from the first half and even passed over 100 people the 2nd half. Watch out when she gets well. She's going to come back strong!! What a wonderful report. It was such a pleasure to see you and Karla out there on Sunday. She is an incredible woman with relentless determination. I am always inspired by her courage and strength. Thanks Mark. Sorry I missed you. We did see Darrell and spoke to him as he went by and he told us about you missing the bus.